The image I see when I hear the term "hedge witch" is that of a traditional wise-woman walking along a wayside in a meadow, a basket in her arm, gathering herbs and flowers from the hedgerows to use in the cooking pot or for a healing balm or maybe a magic potion. As she walks, she watches the way the leaves on the bushes blow in the wind, knowing from ancient weather-lore that this will tell her if it will rain or if the sun will shine. But a hedge witch is much more than that, and the hedges she crosses can be those that represent the barrier between this world and the world of the spirits as much as the boundary between a field and country lane. A new book called Hedge Witchcraft, by Harmonia Saille, author of Walking the Faery Pathway, attempts to explain exactly what a hedge witch does, and how anyone with the willingness to learn can follow in the hedge witch's footsteps to learn her craft. Publisher Moon Books says about the book on its website: "There is no dogma attached to hedge witchcraft. There are no tenets to follow. And if you asked a hundred hedge witches what their practice is, you will get a variety of different answers. The path of a hedge witch is very much an individual one, and it is a solitary practice. This book will guide you if you wish to read more about hedge witchcraft as a pathway, or are already following such a path and wish to progress." Hedge Witchcraft explains that learning to be a hedge witch is more about getting outside and learning directly from the land, sea and sky than about conducting rituals found in books. Harmonia says: "As a hedge witch, it is better to go out and experience nature than sit in, think and read constantly." The book begins by explaining how to connect with nature - by using all your senses to get to know the world around you, then to go further and to use your extra-sensory powers of visualisation to: "Shapeshift into nature by becoming what you see". This is the essential skill of the hedge witch; the portal to learning how to communicate with nature spirits and even with the divine essence of the landscape. Of course, there is a lot more to being a hedge witch than that. Herb lore, folk magic and divination are all things a hedge witch would be expected to know about - and this book offers an introduction to those subjects. It also explains the major seasonal festivals of the wheel of the year that are honoured by most pagans today with celebrations and rites. Perhaps the main feature of hedge witchcraft is hedge riding. Harmonia explains: "The ‘hedge’ in ‘hedge witch’ has more than one meaning. Primarily the hedge is the boundary separating this world and the otherworld, the hedge witch crosses the hedge to explore the realms of the otherworld." Hedge riding is similar to the shamanic practice of journeying. The hedge rider’s consciousness travels to the otherworld, which is the realm of the collective unconscious, to encounter archetypal symbols - or spiritual entities - and gain knowledge. The book explains the basic ways of doing this as an introduction to the subject. However, Harmonia said: "It only has a little about hedge riding and hedge magic as this book has too small a scope to include them. Please read my accompanying books in the Pagan Portal series, Hedge Riding and Hedge Magic, following soon." 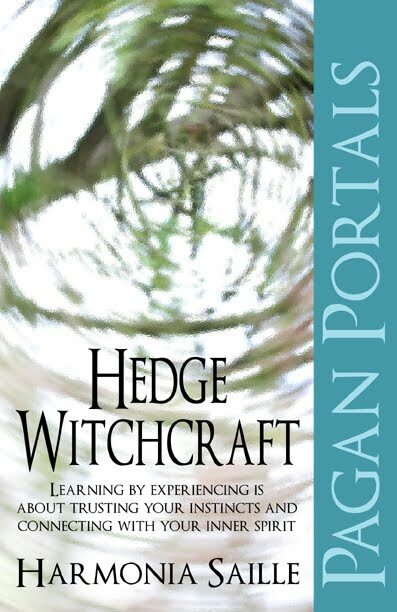 I would recommend Pagan Portals - Hedge Witchcraft as an introduction to hedge witchcraft for anyone who wanted to learn the basics of this craft. I will be reviewing Harmonia's books on Hedge Riding and Hedge Magic when I've read them - which I'm looking forward to doing. Oathbound, This book doesn't really focus on hedgeriding. It introduces the topic, but the next book in the series - called Pagan Portals Hedgeriding - will be the book that focusses on it.